Your hair goes through a lot. Sun, hot tools, styling, ponytails, pollution, even hair washing are all things that damage your hair to some degree. So once every 6 months I do the ultimate hair cleanse! Here is a step by step of how I treat my hair during this 2 week process. Monday - I go to the salon (or a local hair school) and get a deep conditioning or scalp treatment. I usually get the scalp treatment because I have dandruff, but either works. At the salon they will wash my hair. I do not wash it at home before or after. I love to get a Brazilian B3 Demi Permanent treatment, which is offered at many salons that do Brazilian Blowouts. Tuesday - No Hair Washing. Wednesday - No Hair Washing. Sunday - Shampoo and Conditioner. Monday - No Hair Washing. Wednesday - At Home Hair Treatment, I wash my hair in the shower after (with conditioner after!). Thursday - No Hair Washing. Friday - No Hair Washing. Sunday - At Home Hair Treatment, I wash my hair in the shower after (with conditioner after!). Then your hair cleanse is done! So why all the "No Hair Washing" days? Your hair collects essential oils and vitamins to help keep it conditioned and strong. When we wash our hair, it sends all of those vitamins down the drain. Conditioner replaces some of them, but not all of them. It also resets your scalp in a way. It allows your scalp to see that you have enough oils so it doesn't go into overdrive producing them. As for the at-home hair treatments I have many I love. You can do something simple like organic coconut oil. Other good DIY hair treatment products would be Virgin Olive Oil, Avocado, and eggs. But stay away from sticky things like Honey during this process and you should never add citrus ingredients like lemon, lime or oranges. I know you hair will look greasy often through out this process. But you hair will be so much healthier and you will be able to notice a difference. Plus while hot tools are banned during this process (using hot tools while to many oils are on your hair can fry your hair, literally) you are allowed to style your hair. For these two weeks, fun messy buns, sock buns, and braids are your best friends! Some of you might find that during this process your hair smells. Some people have this problem, others don't, I find it's usually based on your diet and environments both at work and home. If you are having trouble with smelly locks you can use a sulfate free shampoo ONCE anytime there is two days in a row that say "No Hair Washing". but you may not do it on both days. Redken has my favorite sulfate free shampoos. They have one called Nature's Rescue Hair Detox Sulfate Free Shampoo, which is suitable for all hair types. They have another one called Redken Color Extend Magnetics Sulfate Free Shampoo, which is best for those with color treated hair. 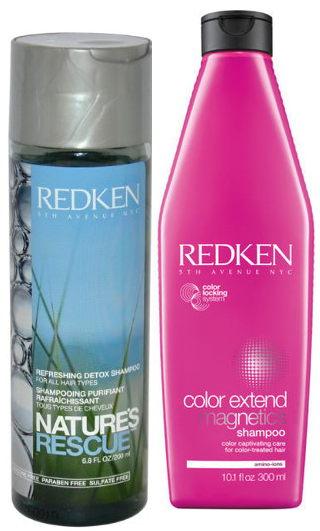 Do not get the Color Extend Magnetics Sulfate Free (pink bottle) and the normal Color Extend (red bottle) Shampoos mixed up! To get the scoop on hair treatments and deep conditioners click HERE! That concludes the instructions for the Ultimate Hair Cleanse! Happy Cleansing everyone!